The secrets to a SharePoint success! Two years ago I published my book ‘Digital success or digital disaster?‘ that unlocked how you can successfully manage your intranet by following the examples and practical advice given in each chapter. I avoided describing specific technologies however, one technology is quite pervasive – Microsoft SharePoint – and I have encountered it many times, both good and bad, in my work. Wherever I go people ask me “How do I manage SharePoint successfully?”. My answer is covered in a new chapter that explores the pitfalls and benefits of using SharePoint to underpin your intranet, and sets out ways to make sure you implement successfully using the principles that I set out apply to intranets. Everyone will have heard of a horror story of how an intranet has failed or succumbed to the perils of SharePoint. But people will also have seen examples of how SharePoint has transformed an intranet quickly and with little effort. Somewhere in between these two versions lies the truth that most intranet managers have experienced. It seems to take a lot of effort, hard work and time to implement SharePoint. And that just seems to be the beginning of the daily challenges you have to act upon. That analogy has proven to be oh so true, time and time again. Even after many new versions and enhanced features in SharePoint, improving what it offers, intranet managers still have a feeling of trepidation when confronted with SharePoint, especially for the first time. So how do you educate and communicate with people who use SharePoint? How do they use the right features in the right manner? How do you adopt the right approach so everyone benefits? It can be done but it is not easy. I know from my experience shared in this new chapter. I will show you the secret of a well-managed intranet using SharePoint, setting out the steps you need to take to achieve this without too much hard work, missed deadlines or sleepless nights! To make sure you get the right balance and gain the full benefits of an intranet or digital workplace, you need a clear strategy and purpose for how well it is managed. By following the direction set by your strategy and principles defining its purpose the next steps are to develop the governance framework. Defining the scope of your governance framework creates clarity for people in your organisation on what is included or excluded. This is important if your intranet transforms into a digital workplace. As your intranet changes in its size and scope, so your governance framework will need to change to reflect this. Create confidence that you have a clear purpose for the intranet. Show how it supports yourorganisation’s goals. This will make it easier for you to make the changes needed to the way your intranet is managed and developed. Your organisation should be clear about the reasons for these changes. It will then be confident they will improve its effectiveness, and benefit people using the intranet. Sharing your strategy and governance framework with your stakeholders will reassure them why they are supporting you. You need to define your publishing model. You should design it to provide the right conditions for a consistently good experience. This applies whether people are publishing or accessing information or applications on your intranet. When developing your governance framework, consider including the different types of content – accredited and collaborative – and applications. You should also factor in how people use the intranet when implementing your framework. Once you have your scope and purpose outlined, you need to ensure everyone is clear about their responsibilities. Having a hierarchy that links all the roles together and shows their responsibilities creates that clarity. It also helps everyone to understand clearly how their activities affect other people. Making it available on the intranet also gives it transparency and can prevent any confusion or misunderstandings. Your governance hierarchy should have three levels. Firstly, the strategic level for roles responsible for setting the direction for your intranet. The intranet owner, champion, stakeholder and a steering group are all roles who can have responsibility for your strategy. At the hub level, the intranet manager is the conduit in the governance hierarchy between the strategic and operational levels. This role implements the decisions made about strategy, direction and timing of implementation. Good communication channels and decision-making help everyone to understand what is happening and how they may be affected. Lastly, at the operational level, you have the intranet team members and the wider publishing community. These roles are responsible for implementing the strategy operationally, with day-to-day activities of publishing, editing, managing, reviewing, updating and removing content. 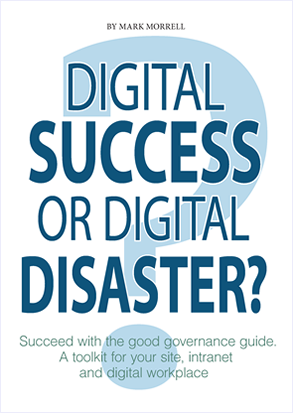 Find out more about practical best-practice examples in ‘Digital success or digital disaster?‘. Why not read the introductory chapter?